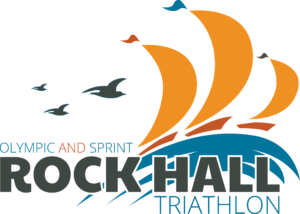 The Rock Hall Triathlons are nestled on the edge of the Eastern Shore of Maryland in picturesque Kent County and only 18 miles from Baltimore “as the fish swims” (put your bike rack on a boat!). Rock Hall is one of the friendliest, most laid back towns anywhere…and is full of history. George Washington took the Annapolis Ferry to Rock Hall nearly ten times before heading to Philly on horseback to work out America’s Independence! The swim takes place in Rock Hall Harbor on the Chesapeake Bay, protecting athletes from any serious wind or chop. The bike course is a triathlete’s dream with beautiful ribbons of pavement and wide shoulders throughout most of the rural course. The run course is pancake flat and takes athletes through the quaint nautically themed neighborhoods and side roads of Rock Hall, MD. This race is worth the trip to Maryland’s Eastern Shore. Check out some of our VIDEO’s from prior years and see why athletes consistently come back year after year to race. Don’t miss out, register today. Swim: The Rock Hall swim course is unlike any other swim course on the East Coast. Not only is this beautiful course lined with sailing vessels, it has 2 unique features that make it an ideal swim venue. As you study the maps you’ll notice we swim around the perimeter of the harbor, that’s because the center of the harbor is just 2-3′ deep! So, if you get nervous, swim a bit to your left and stand up! The second feature is that the harbor has a breakwater designed to keep wind or waves from affecting the waters we swim in. So, we are usually swimming in nice, calm waters! This race features an in-water start at the city dock a short walk from transition. The International Swim Course is a two (2) loop 1500 meter point to point swim around the perimeter of the harbor which finishes at the end of “A-Dock” adjacent to the Waterman’s Restaurant. Athletes will climb a ladder out then run 300 meters down the dock to transition (Pro Tip: Leave a set of shoes at swim finish to slip into for the run to transition). We expect the water temperature to be in the mid 70’s race weekend. We will post a preliminary water temperature the Thursday evening prior to the event with an official reading taken and posted by our USAT officials race morning You can also check the real-time status of the NOAA buoy located about 4 nautical miles from the Harbor. Bike: The bike course is fast and mostly flat with the exception of a small hill at mile 13 on Earl Nicholson Rd. The course is generally well paved and goes through wide open cropland. If it is windy, think twice about riding a disk wheel. With a minimum of turns, you can get into your aero position and crush the big ring. The Eastern Shore is a beautiful part of the country and this bike course takes lets you revel in that beauty for 24 gorgeous miles. Run: The Olympic run course is a 2 loop course with several short out and back sections. This pancake flat road course meanders the quaint neighborhoods of Rock Hall where you’ll see crab-pots and sailboats in the front yards of residents. There are aid stations stocked with water, Gatorade and ice every mile or so and there is plenty of post race food and music back at the race site. 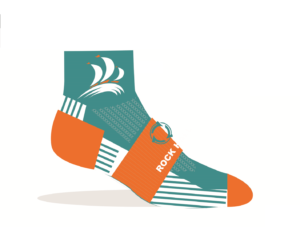 Do the Double: Would you like to race both days of the Rock Hall Triathlon Festival weekend? If so when you register for the 1st race you will be prompted to register for the second race saving you 20% off the highest price race! This race features an in-water start at the city dock a short walk from transition. The Sprint is a 750 meter point to point swim around the perimeter of the harbor and finishes at the end of “A-Dock” adjacent to the Waterman’s Restaurant. Athletes will climb a ladder out then run 300 meters down the dock to transition (Pro Tip: Leave a set of shoes at swim finish to slip into for the run to transition). We expect the water temperature to be in the mid 70’s race weekend. We will post a preliminary water temperature the Thursday evening prior to the event with an official reading taken and posted by our USAT officials race morning You can also check the real-time status of the NOAA buoy located about 4 nautical miles from the Harbor. Bike: The bike course is fast and mostly flat with the exception of a few minor rollers. The course is generally well paved and goes through wide open cropland. If it is windy, think twice about riding a disk wheel. With a minimum of turns, you can get into your aero position and crush the big ring. The Eastern Shore is a beautiful part of the country and this bike course takes lets you revel in that beauty for 15 gorgeous miles. Run: The Sprint run course is a one (1) loop course with several short out and back sections. This pancake flat road course meanders the quaint neighborhoods of Rock Hall where you’ll see crab-pots and sailboats in the front yards of residents. There are water stations every mile or so and there is plenty of post race food and music back at the race site. You’ll love our swag! 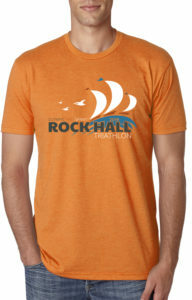 All athletes receive a Tri-Blend Race Shirt, Custom Race Socks and a super cool Rock Hall themed Finisher’s Medal. Also, don’t forget the DJ, bounce house for the kids and fabulous post race spread. Lastly, please, no swimming in the Harbor prior to the actual race. This is an active, working harbor and they are generally not looking for swimmers. If you REALLY need to get your pre-swim in, go to Ferry Park in Rock Hall. This an unguarded beach on the Chesapeake Bay where swimming is allowed. Chessie Photo will be attending this event and capturing images throughout the race course. Athletes will receive a customized email after the race with automated links to find your images. You may also go directly to their website to review their custom products, and purchase your photos from this and other Series Events. If you have questions, this is the meeting attend. An overview of the courses will be given and Q&A will be encouraged. If you have questions, this is the meeting to come to. An overview of the courses will be given and Q&A will be encouraged. Rock Hall Lodging – Are you looking for a quaint B&B to spend the weekend in Rock Hall during your race? Just click on the link above to explore the town and make a reservation. Be sure to do this EARLY as lodging fills up quickly! Click HERE for a listing of hotels in Kent Narrows. This area is on the Eastern Shore just across the Bay Bridge from Annapolis, MD. There are plenty of restaurants, hotels, and shopping to get your fix before or after your race. Bay Shore Campground – Located just 3 miles from Main Street in Rock Hall! Bayshore has tent camping sites with amazing views of the Chesapeake Bay Bridge.